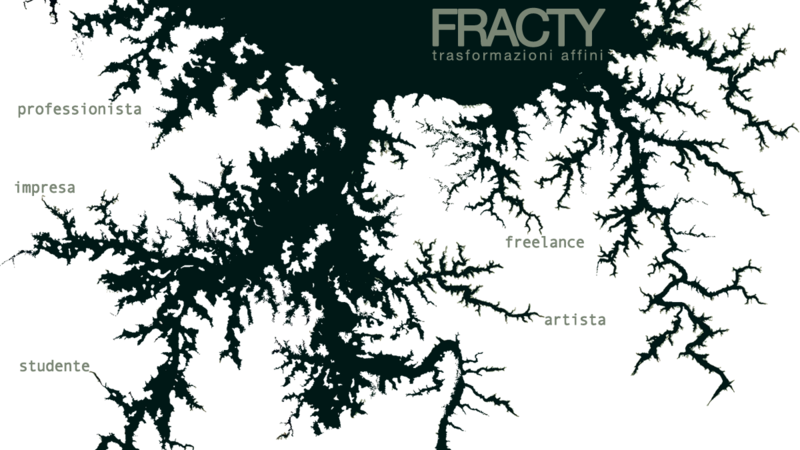 “Fracty” is a project submitted by Digicult at “Che Fare” Italian fund of 100.000: a private fund giving sources to new ideas that could be able to face the economical crisis, general cuts to culture, economy breakdowns, using online networking systems, peer-to-peer tools and instruments, open source technologies. “Fracty” is an on-line platform, a meeting point between supply and demand of cultural and artistic production in the context of digital technologies applied to contemporary creativity. The project is inspired by the structure of fractals, to give life to a complex economic – cultural system which arise from the modularity of the individual systems that compose it, and that it is by its very nature, scalable and replicable. “Fracty” aims to develop a correspondence between: investors (private and public) in the world of IT , art and culture – the digital creative industry professionals – students in training. The portal has the aim of developing innovative projects and contribute to a meritocratic and egalitarian redistribution of economies that underlie the production of a cultural object. The platform will allow forms of direct interaction among users, in order to propose the sharing of project requirement , suggest the creation of cultural and artistic models , fueling the search for new meritocratic working collaborations . Currently, a growing number of professionals in the creative industries perceives the net as the main tool to raise awareness of their work and start collaborative projects. Even though the online presence of artists, designers and professionals of contemporary culture can be considered a showcase to enter the business world and its commissions, this is a first step, which has still to be directed towards business models that lead to the contact between supply and offer. In the artistic field, of design and digital culture in a broad sense, the professional use of social networks is a habit, but isn’t still used to bridge the divide with the most generalist public, institutions (public and private), and productive realities interested to R&D technologies. The professionals of the creative industry (such as: multimedia artists, designers, cultural operators, publishers, marketers, online communication professionals ) show resistance to start a direct dialogue with the client world, which origins from their perception of a lack of transparency in the selection process and the difficulty in understanding each other’s needs. At the same time, the client world, (which includes, for example: corporations, foundations, government agencies and authorities, small and medium local enterprises ) suffers a lack of access to the resources offered by the creative and innovative world of art and digital culture. A major interaction between these two categories (and a third category represented by the education world) would be a key element to create new professional synergies, new economic alternatives to the usual supply chains and traditional business models, starting new and effective partnerships aimed at the production of specific innovative effects in the country. The design of the online platform FRACTY / Affine Transformations is based on the idea of facilitating the processes described, providing an online meeting point between supply and demand in the cultural and artistic production. The project takes its name from fractals, geometric objects existing in nature, with have internal dilation: that is, their overall shape arises from the scalable repetition of an identical primary departure shape. The fractal can endlessly repeat its structure, which makes it a complex entity, whose existence is given by the sum of the individual parts that make it up. The geometric transformation, which is the basis of fractals, is called “Affine Transformation”. The project FRACTY / Affine Transformations therefore takes its cue from the fractal structure to think about a cultural-economic complex, which arise from the modularity of the individual systems that compose it, and which by its very nature is scalable and replicable. The portal aims to develop innovative projects and contribute to an egalitarian and meritocratic redistribution of economies, that underlie the production of a cultural and contemporary artistic object (event, work, clients, markets). Every person who is involved in the Network and platform (it can be a client, a professional or a student), will be online with an account controlled by the same person. The account will be used to show the user’s activities, past and present (and future projects), allowing forms of direct interaction between users, also proposing the collaboration in required project, suggesting the production and realization of possible artistic and cultural models, increasing the search for new working collaborations. This will be done in full transparency of processes, dynamics, contractual and economic relations. The project aims on one hand to technology professionals and digital arts, as well as the most brilliant students of universities and academies and new professionals graduates / graduates from these institutions, and other entities that want to invest in this sector. Users can know each other, understand each other’s philosophies, needs and aspirations, and then choose eachother, through aesthetic affinity and perspectives, minimizing misunderstandings. In an industrial world, which focuses more carefully on the broad spectrum of its stakeholders, to create competitive advantages and perpetuate good business practices, access to investment in the arts, culture and creativity in relation to the use technology and science. This is a necessary and long overdue step, even in the vision of starting projects of Corporate Social Responsibility (CSR) in education creativity and technological innovation. Equally, for the producers of cultural content, the network FRACTY / Affine Transformations would be a functional means to expand its partners’ network and forge new partnerships. The ultimate goal of the project wants to fill the void, that in our country is an obstacle to a genuine process of innovation on the interaction between businesss and the artistic-cultural field. Grow a new generation of creative producers in the Europe of 2020 means supporting a process of conscious growth. The cultural and artistic producer shall be provided with a place for discussion and information about their rights, in a context that wants to protect their greatest resource: their creativity. The platform aims to promote a progressive mechanism of emancipation management of cultural producers, creating the basis for a transparent dialogue and balanced between supply and demand.